What’s a Poacher in Soccer? Why do we want to know whats a poacher in soccer? Well, there is a statistic floating around soccer that says the modern player is in contact with the ball for an average of only 1 minute 27 seconds in a professional soccer match! Imagine being paid $200,000 each week to kick a ball around for under 2 minutes of your time! Of course, there are only a few players at the top of world soccer who command these incredible earnings but the point remains that for all their value and worth the average top class player is showcasing their ball skills for just over a minute at a time. There is a certain type of player though who stretches this incredible statistic even further because they touch the ball so little, and they’re often the highest paid player in the team. The goal ‘poacher’ was once a staple requirement for any team who was keen to maximize their goal scoring and were prepared to carry a player in their team whose sole job was to put the ball in the net. Poachers are a particular type of striker who rarely take part in attacking build-up play but instead concentrate on ensuring they’re in space inside the penalty area ready to be first to the ball and shoot into the goal. Always alert and on the move poachers are a nightmare for defenders because they’re constantly changing positions to try to gain an advantage over their opponents. Whilst they are always on the move they don't actually cover huge distances as many classic goal poachers play exclusively between the width of the 18 yard penalty box and some even concentrate solely on playing between the goal posts. The deadly combination of their alertness and anticipation of where the ball is going to be means they score lots of goals. The overwhelming proportion of their goals are scruffy and unattractive, for instance ‘tap-ins’ from 2 yards out or rebounds from goalkeepers’ saves, deflections of other teammates shots or responding first to a ball that has hit the crossbar or the post. These are all classic poachers’ goals. Another characteristic of the goal poacher is their ability to score with only one touch. The skill in executing a one touch finish is difficult to master. Getting the right pace, accuracy and swerve on the ball with one touch, sometimes off balance and virtually always under pressure takes a high level of skill. Often the target is only open to score in for a fraction of a second before the chance is gone and so being able to get your shot away, and get power into the ball without an extravagant back lift is vital. So many footballers panic in front of goal and want to set the ball perfectly for themselves to shoot, however the best goal scorers and poachers in the world are able to finish with just one touch. Watch these two shooting drills, one to practice by yourself and one to practice in a team environment to sharpen your one touch finishing ability. ​One of the greatest goal poachers of all time was the German center forward Gerd Muller. Like many goal poachers he was small and powerful in size and build and it was his low center of gravity that allowed him to react quickly to balls in the penalty area and helped him score a huge number of goals. He helped Germany to win the World Cup in 1974 and his overall goal scoring record was incredible amassing 68 goals in just 62 international games. 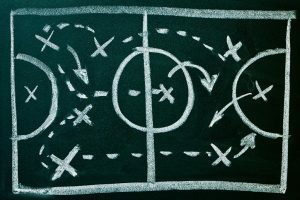 Many soccer teams now look for strikers who can offer more in build up play rather than just rely on a player who comes to life in the penalty area, and with this shift in style the classic goal poacher has largely been lost. One of the last great goal poachers was England center forward Michael Owen he first burst onto the scene at Liverpool as a 17 year old and scored some sensational goals using his explosive pace to run in behind defenders and finish. This is an interesting video of him at the end of his career when injuries had robbed him of much of his pace. Notice how by this stage he is reliant on his intelligent movement to create space for himself inside the penalty area. Also notice how many of the 17 goals that he scores for Manchester United in this video are from between the posts. Playing right through the middle of the field and providing a threat to defenders in this way he was able to continue his incredible goal scoring even though injuries had long since taken their toll on him. Watch his movement in the build-up, he is often not involved but always on the move in the penalty area looking for opportunities. You can always learn from watching classic goal poachers. There will always be room in the game for players who can score goals and poachers can teach us how to them better than anyone. Who is your favourite goal poacher of all time? Why are soccer poacher's so hard to find? Does every team need a poacher?